. You may post as many different titles as you'd like. Here’s a brief description of the series. Good luck! I can’t wait to read what you come up! XXXOOO PC The books are set in a time of rebirth. The modern world as we know it has completely self-destructed and those left behind have changed…evolved…bonding with the few plants and animals that have also survived. These people live simple lives in the forest and on the plains using the sun and the moon as their sources of power. They draw down the energy of day and night, and are fed, body and spirit, by the two opposites, and by the Earth herself. At the heart of the first book is a young female protagonist, born illegitimately of two enemy tribes. She has been hidden away her whole life until heartbreaking circumstances force her to find the courage to accept herself and her destiny. If this new realm of survivors are going to reclaim their humanity they must seek inventive solutions to rebuild themselves and their world while encountering adversity, love, and loss set against a stark background of breathtaking beauty that holds both life and death. This is so amazing that you are giving fans a chance to help you name your series. I can't wait to check it out. 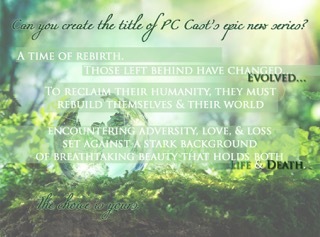 My suggestions: Earth Evolved or Evolved Earth; Humanity Reborn; or The Sun, Moon, & Earth (series/saga/trilogy). I'll post again if my imagination comes up with more. I agree with Eve I love all of you're books and I'm excited to read this one. Hmmm, maybe I will think of more later. Ah this is so amazing for fans of your writing to be given the chance to actually NAME your book series. Im horrible at names and so forth but a few that have come through my head are; Earths Day, Turning Earth, Nights Day, Days Night, Planet Revolution, Spirit Planet, The Dark side of Earth, Two-faced Earth, Earth Reborn. I love the depth you go to; I love books that make me think! I'm thrilled to participate here, thank you! Here is a few for now i'm totally overflowing with ideas and I love the idea of possibly getting to name a series so even if not chosen I will put any I think would work for it. Best of luck to everyone. Thx so much for this fun opportunity to live vicariously through a favorite author! First off I think this is an amazing idea and am loving the new book already! And no matter what name you chose I will read the series and I know I will love it! Making space on the book shelf as we speak! My suggestion is Genesis Rising or maybe Genesis Reborn? Earth Builder, Beautiful Death, Beautiful Life, Humanity Rebuild, Evolution of Life, Lifes Evolution, Atom Binding, Earths Promise, Eternity on Earth, Earths Beauty, Earths Chastity, Humanity Evolved, Natures Way, Natures Beauty, Natural Order, Natures Evolution, Balance of Nature, Natures Balance, Way of the earth, Earths Trials, Earths Test, Earths Fire, Evolution of Us, People of Earth, Two Faced/Faces, blood Moon, Shadow Transit, Dawn of the Earth, Lunar Eclipse, Solar Eclipse, Gentle Earth, Makeup of Earth, Earths Plates, Earths Rush, After Sun, Double Effect, Correction of Earth, Earths Ego.